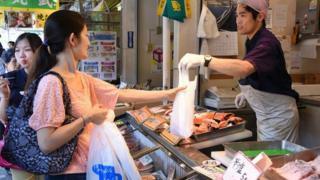 Japan's economy grew faster than expected between January and March, boosting hopes that the economy is recovering from last year's recession. The economy expanded 0.6% in the period compared to the previous quarter, marking its second consecutive quarter of growth. The result was far better than the 0.4% analysts had expected. On an annualised basis, the economy grew 2.4% in the period against forecasts of 1.5%. Analysts said the first quarter growth rate was "very positive". "The recovery seems to be well on track," Tony Nash, chief economist at Complete Intelligence, told the BBC. "This must bring a smile to Prime Minister Abe's face and is a vindication that his economic policies are moving things in the right direction." The country came out of recession in the fourth quarter of last year. Japan relies on domestic consumption for about 60% of its economy, but it has been recovering from a sales tax hike which has dampened spending. Private consumption and capital spending were both up 0.4% in the quarter, but capital spending was expected to rise by 0.8%. Capital Economics analyst Marcel Thieliant said in a note that the acceleration in economic growth for the period "was mostly due to a jump in inventories". "And a range of indicators point to a slowdown in the second quarter. "Industrial production in March was 4% below its January peak, and the drop in the manufacturing PMI (Purchasing Manager's Index) to a multi-month low in April suggests that conditions are unlikely to improve quickly," he added. Other headwinds Japan's economy has been facing include wages, which have remained stagnant for several years, together with a weaker yen, which makes imported goods more expensive for consumers on the home front. On the upside however, the weaker yen does give a boost to the country's big exporters, like Toyota, because it makes their goods cheaper to buy overseas. It also helps their bottom line when they repatriate money made from overseas operations. Corporate decisions about their inventory levels have been the main driver of growth, or disappointment, for the year. It is an important indicator for growth during a recovery because companies will only increase inventories when they expect increasing demand. Inventories have become more important than usual in Japan because the sales tax hike disrupted demand patterns so much, and because Japanese companies are coming out of a long phase - almost 20 years - of cutting costs and downsizing in Japan's ageing economy. In such an environment, corporate optimism does not lead to more investment immediately; companies will first boost their existing capacities until they become insufficient - that is, until inventories first build up and then get sold. The first step is what we are seeing. The next step is selling production through exports and to consumers, producing higher incomes on the way. If that works - we would finally see a sustainable recovery, driven by the private - not government - sector. The Bank of Japan's current easing programme is designed to stimulate the country's economy by encouraging more lending, which in turn should see increased consumer spending. It also hopes to drive greater investment activity and boost inflation. The latest growth figures meant the chances of further near-term easing had diminished, said Mr Thieliant, but "with price pressures likely to remain subdued, more stimulus will be needed before too long, with the October meeting now the most likely venue."